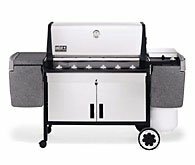 Constructed with the sleekness and durability of stainless steel, Weber's Summit grills are arguably the most refined gas grills ever built. The Summit Gold D stands 61 inches tall, 68 inches wide, and 30 inches deep and features an input of 57,600 Btu's per hour. A brand-new burner system, featuring six burner controls on the front of the grill, allows all 648 square inches of the primary cooking area to heat evenly and thoroughly. The Crossover Ignition System lights all burners in succession with the push of one button. The Gold D's expanded total cooking surface of 902 square inches, including main grates, warm-up basket, and warming rack, makes it easy to use various cooking styles: direct grilling for steaks and hamburgers combined with indirect heat for keeping grilled foods warm, toasting bread, or cooking delicate foods like fish and vegetables. The deluxe model in the Summit series, the Gold D also comes with 1) a handy side burner for whipping up side dishes as you grill, 2) a stainless-steel smoker box to give your feasts the option of a smokehouse flavor, and 3) a stainless-steel rear-mounted rotisserie, powered by a 110-voltheavy-duty motor, that allows heat to radiate evenly when cooking roasts, or chicken, or turkey. The Summit Gold D also boasts restaurant-grade enhancements, such as a commercial-grade front-mounted thermometer and two stainless steel grates that are robot-welded together for incredible strength. 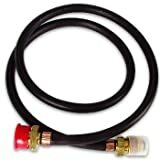 With the 12-foot quick-disconnect hose, connecting your natural gas supply is, literally, a snap. There are even spiderproof screens specially created to eliminate the frustrating problem of burner tubes clogged by cobwebs--Weber really did think of everything. At this PRICE! it should come with a FREE Side Of Beef! While I feel that this is a great grill, I also feel it is extremely over priced. Two days after purcasing this grill I went to Lowes, and subsequently Home Depot, and Builders Square. All of which have higher quality grills at a price of at least $700.00 less. These grills are of a higher quality construction, and materials. They have a higher BTU, and are made by a brand name manufacturer. Needless to say, I sent this grill packing as fast as I could!!!!! I have owned this grill for about 5 years (since it first came out). What attracted me to the Summit were the Weber system in general and the stainless steel components in particular. The cooking surface is restaurant quality. It's easy to maintain and I can report that it cooks the same today as it did 5 years ago. The six burners may seem like overkill (visitors always comment with a snicker about how huge it is), but believe me -- it's extremely easy to use that much cooking space, even for a small family. Imagine being able to grill 3 different types of vegetables while simultaneously searing burgers or chops or fish, all at different temperatures. Imagine having enough room to roast/smoke a 25 lb. turkey entirely with indirect heat (one burner going on either side of the bird with no direct heat underneath). By the way, Cook's Illustrated Magazine has rated grills a couple of times. 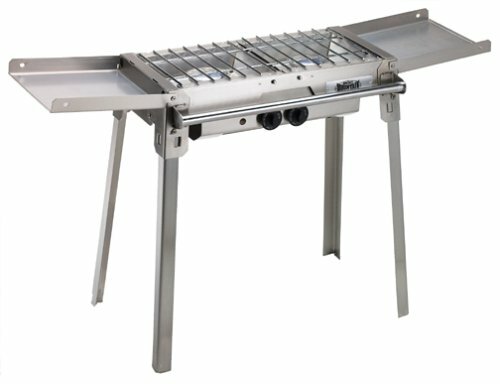 They generally conclude that the high-end, $1000+ stainless steel grills are not worth the money -- except for the Weber Summit. The only fault they find with it is that it's only marginally better than the high-end Weber Platinum models that cost hundreds less. We love the Weber Genesis Gold C gas grill, but there is one amazing design flaw: the handle of the gas grill gets as hot as the inside of the grill! Not sure why Weber has a handle that conducts heat, but you must wear a very thick oven-mitt to not get burned. We've had the grill for over 2 years, and every once in a while I still forget and get a nice burn. Other than that, it's a great grill. I didn't want to buy my Weber before the patio is done. Which will be in late June. But, something happened. Then, the Weber end up in my garage. You know the story. I spent three months researching gas grills. Checked into brands including Jenn-Air, NexGrill, Char-Broil, COSTCO brands and Weber. I emphasized on two things, how well does the grill cook and how long will the grill last. I don't care how bad or cheap it looks, don't care about any special features (smoker tray, rotisserie kit). 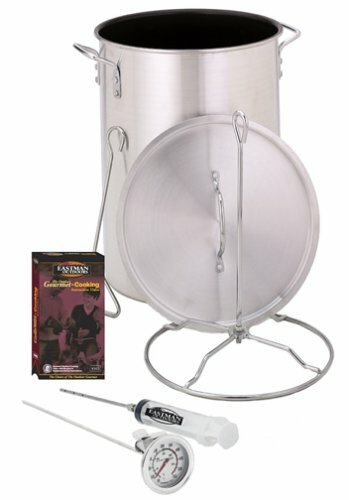 What I found out from reading reviews on alt.food.barbecue, amazon.com and several other grilling/barbecue web sites is that countless people swear on their Weber gas grill, all the other brands together have less than a hand full of people. Also buying and reading the two best grilling book before the purchase helped me a lot in what I should really look into in detail. I am, or shall I dare say "was" :-), not an expert griller. I was able to fully understand what the books said and able to follow the books. Which results in perfect food. My ribs are better than the ones from Sweet Water Tavern. The baby back ribs from Sweet Water Tavern was my family's favorite. With the same amount of money we paid for a rack, we can have 4 full racks now. Anyways, back to the books. The Weber book explains in detail about the characters of different food and also how to take advantage of their characters not just deal with them. I was able to understand the grill better because I understand the food, which the grill is designed to deal with, better. I am not going to say too much about grills other than Weber's because I've never used them. All the knowledge I have about them is from other people's experience. The conclusion I draw from my research, alt.food.barbecue, web sites, Consumer Report and a cooking magazine(forgot name), is that if you want the same cooking quality like Weber, you would have to pay more than 3 times for other brands. And Weber throw in the unparalleled durability and quality pre/post sale customer service for free. I bought the Genesis Gold C because of the durability of Stainless steel parts. Though many people in their review said the cast iron sear stack better. I still went for the stainless steel and paid more. Now, after 3 meal of perfectly seared stack, I realized that I could have saved some if I went for the Genesis Silver. No regret though. I would not recommend stainless steel grates other than the solid thick bar type grates on other brand's grill. The reason Weber's relative thin stainless steel grates can still sear great is because the grill can reach 800F. Yes, you read me correctly, my Weber can reach Eight Hundred Degree F with only 36000 BTUs. This actually caused me some problem when I tried to do some medium temperature cooking. The grill would not drop below 300F. I read about this in reviews and also called Weber. The reason is that the new stainless steal cover reflects heat too well. After several usage, the inside of cover looks dark brown and black and the grill surly can drop to around 250F now. Not like the Coleman, which grills food pretty well but took my friend 6 hours to assemble. My Weber took me 15 min to assemble. Only 8 big scrolls. Weber even provides tools to do it. Weber's customer service is perfect. Never had to wait for more than 2 min. You might say if the grill's quality is good, why would you ever call customer support. This might be true for you expert grillers, but not for me. I appreciate very much Weber support people's courtesy and knowledge of their product. We're heading into our second summer with our Genesis Gold C. It's been GREAT! It is very well designed and built. The flexibility of the 3 burners with the wide heat output range makes anything possible. It's a nice big grill, something I've needed for a long time. I added the smoker accessory which takes away about 3 inches of grill space, but there's still plenty left. And the smoker works well. I especially like all the "counter" space you get with the Gold C. I haven't used the side burner as much as I expected, but it was handy when I wanted it. It's so unbelievably good to not have to deal with charcoal! Turn it on, turn it off - so simple, so clean! When I was shopping, I was concerned about the welded sheet metal grate. I was skeptical that they wouldn't cook the meat as well as welded rods (like those in the Summit) or the cast iron grate that comes with this grill at Home Depot. No worry - the stainless steel grate works wonderfully! It cleans up real nice and it isn't rusting away or sagging, at all. There are only a couple things that bother me about the grill: the wheels and the way the frame screws tend to work loose. The main wheels are the same as those on my old (real old) Weber Kettle, and those eventually disintegrated. The Genesis wheels show no signs of that happening, but eventually, I'm afraid they will. The little swivel casters on the other end really don't feel like outdoor sort of wheels. They get bogged down in my grass and I tend to lift that end and move it around like a wheel barrow. Maybe that's what causes the frame screws to periodically work loose. That's annoying, but easily fixed with a socket wrench. By combining the convenient features of their Genesis series grills with the sleekness of durable stainless steel, Weber has created "the most refined gas grill ever built." The Summit Silver B stands 61 inches tall, 60 inches wide, and 30 inches deep and features an input of 44,000 Btu's per hour. A brand-new burner system was designed for the Summit series: burner controls are on the front of the grill, which allows room for four burners, so all 504 square inches of the primary cooking area heat evenly and thoroughly. The Crossover Ignition System allows you to light all burners in succession with the push of one button. 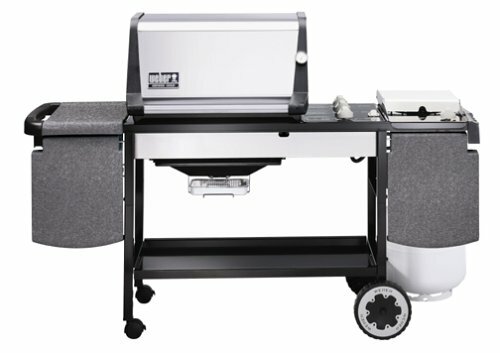 The Silver B's expanded total cooking surface of 700 square inches, including grates, warm-up basket, and warming rack, makes it easier to use various cooking styles: direct grilling for steaks and hamburgers or indirect heat for keeping grilled foods warm, toasting bread, or cooking delicate foods like fish and vegetables. 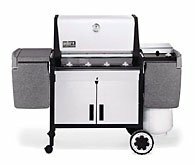 The Silver B also features a handy side burner with 12,000 Btu input that makes cooking side dishes as you grill simple and convenient. The Summit Silver B also has restaurant-grade enhancements, such as a commercial-grade front-mounted thermometer and two stainless steel cooking grate that are robot-welded for incredible strength. The hood, made of lustrous stainless steel, will never rust, peel, or fade, and its brushed stainless-steel handle stays as cool as it looks. Patented Flavorizer bars, made from heavy-gauge stainless steel, eliminate flare-ups and impart a rich flavor by turning meat juice into smoke. This liquid propane (LP) model includes a 20-pound LP tank. There are even spiderproof screens specially created to eliminate the frustrating problem of burner tubes clogged by cobwebs--Weber really did think of everything. No go for weight watchers! We grill almost every day, winter and Summer, we have been "getting along" up to now with a Charboil grill which is cheap, and I am afraid, rather nasty but I didn`t know about Weber in those days. When the Summit arrived, I knew that this was a different level of grilling. The first time I switched it on and fired up I was thinking, "the people who designed this knew what they were doing"
Easy to assemble, an eyecatcher on the deck and a charm to use. Even cleaning it shows that this product was made by someone who KNOWS GRILLING. But be careful, using this baby has made me put on 5 pounds in two weeks. Thats the only down side. This machine is perfect and worth every one of the 999 dollars it cost. If you want viking quality but not viking price, Summit!! I remember looking at a summit grill five years ago but fell for a "Cook On" instead. I remember the sales guy told me if you have the money summit is the only grill worth it. That was five years ago and the summit has just gotten better. The frame is strong, the body of the grill is twice as thick as others and the stainless looks clean. Flavor bars are solid and heavy. Big difference from Genesis! Most grills warn you not to exceen 500F, the Weber wants you to pre heat to 550F. Controls are perfect and look like they will wear well. Cart is good size and sturdy. Warming racks sit high enough you can leave them on and still reach the back of the grill. Four burners is a must and being able to control them like the Weber can is great. To sum it up, easy to build, easy to use, nice cook book comes with and warranty is best in business. This should be a ten year grill so remember that when you buy. This is a true five star grill for those who want to step up from a Genesis or a Target special grill. The Summit Gold D also boasts restaurant-grade enhancements, such as a commercial-grade front-mounted thermometer and two stainless steel cooking grates that are robot-welded for incredible strength. The hood, made of lustrous stainless steel, will never rust, peel, or fade, and its brushed stainless-steel handle stays as cool as it looks. Patented Flavorizer bars, made from heavy-gauge stainless steel, eliminate flare-ups and impart a rich flavor by vaporizing meat juice into steam and smoke. This liquid propane (LP) model includes a 20-pound LP tank. There are even spiderproof screens specially created to eliminate the frustrating problem of burner tubes clogged by cobwebs--Weber really did think of everything. As other reviewers have pointed out, this Grill is fantastic (for a Gas grill). I have always been a charcoal guy and after much prodding from some fellow Gas friends, I decided to go in to the deep end. Primarily I was interested in having a lot of space and more importantly a smoker box. I know you just can't get the same flavor from Gas as you can from a Charcoal grill, so I planned on compensating via wood(smoker box). After using it, it definately makes a difference using the smoker, but charcoal is still better for flavor. The only issue is that this thing is the SUV of grills; It guzzles propane. There is a natural gas hookup option, if I'm not mistaken, but this wasn't an option where mine is physically located. I grill at least twice a week. And, I will tell you that you honestly can't go wrong with Weber. This company has figured out how to design grills that are both easy to use and yield great food. And, its customer service is superb. I used to have a Weber Genesis. I loved that grill, but it was too small. It was getting pretty old, and I replaced it with a large, store-brand grill from CostCo. This grill was all stainless with lots of drawers. It was pretty, and for a large stainless grill, the price was great. The only problem was that if I tried to grill anything but carrots, the grill flared constantly. Chicken with the skin on or rib-eye steaks were, essentially, impossible to cook unless your preferred degree of doneness is charred. And, after a couple of months with some grease on the internals, I had to manually light the grill. Even though the CostCo grill was less than a year old, I gave up and bought the Weber Summit D. What a great grill. No flare ups. Lights every time. Knobs are marked so that you can reproduce heat settings and time your cooking. 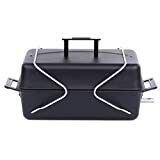 Includes a compartment for wood chips that holds a lot of chips and has its own burner so that you can control the heat producing the smoke and make the chips last. And, it comes with a cookbook that gives fairly explicit instructions for virtually anything you might want to grill and includes some great recipies. If that isn't enough, two more cookbooks from Weber can be bought on Amazon.com. "The Art of the Grill" is great. I haven't tried the rotisserie yet, but plan to this weekend. I expect that the results will be excellent. 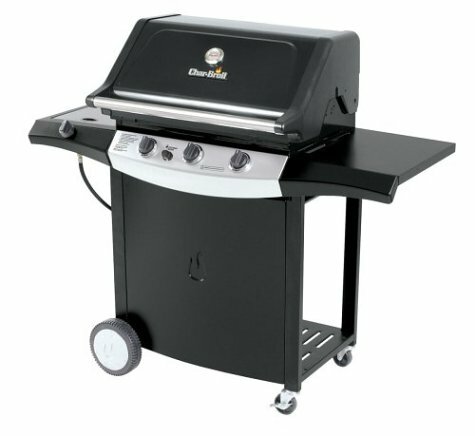 Could the cabinet for this grill have more features considering the grill's cost? Yes. The cabinet just has two doors that open to reveal a large space. I would like it better if the cabinet included drawers. And, it is large enough that it could include several. As to Weber's customer service. It has a Web site that includes recipies and contact information for customer support. Our grill was already put together when we bought it. After we got it home, I noticed that it didn't come with a cookbook. I called the store from which we bought it. I was told that it didn't come with a cookbook. I called Weber. Weber sent me the cookbook at no charge. Then about a week later, I noticed that a small part that goes with the smoking chamber and holds water was missing. (Evidently the store that put the grill together lost the book and this part.) I called Weber. The part was sent at no cost. 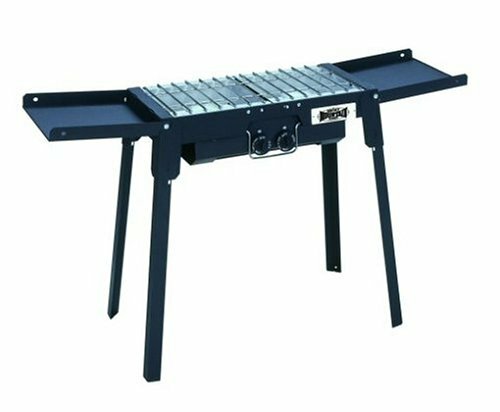 If you're like me and you like to grill, but you are not an artist and don't want to stand over your grill, buy a Weber. I like to put on some steaks or whatever, kick back, and have a beer with minimal interaction with the grill. Sure, you have to time the meat and pay attention to when it should be turned. But, the Weber Summit D makes this easy. It is, in my experience, the easiest way to grill great food. THIS IS WITH OUT A DOUBT, THE BEST GRILL FOR YOUR HARD EARNED MONEY. PUT 3 LARGE CHICKENS ON THE SPIT. TRY A FULL PRIME RIB! A 16LB. TURKEY! SMOKE 6 RACKS OF RIBS! THERE IS NOTHING THAT YOU CANNOT DO. GRILL, SMOKE, ROTISERIE AND DONT FORGET THE SIDE BURNER,FOR THAT POT OF CHILE. DONT BE AFRAID. WEBER KNOWS HOW TO PACK THIS UNIT FOR SHIPPING, ARRIVED WITHOUT A SCRATCH. WENT TOGETHER IN ABOUT A HOUR. FILL THE BOTTLE AND YOU JUST BECAME THE NEXT STEVE RAICHLEN. BAR-B-QUE!!!! I sold a Weber 2000 to get the Summit Gold D. This thing is awesome, and "big". Quality is great. 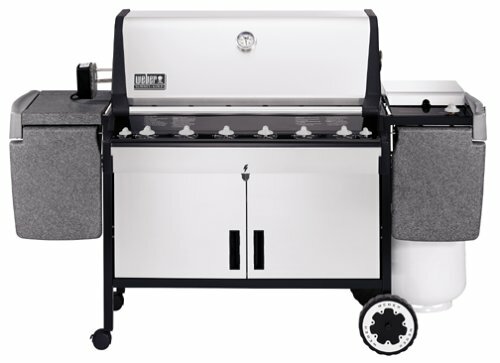 There are plenty of stainless grills out there with lots of bells and whistles, but I don't think there is one that can match the Weber Summit Gold D and Weber's after sales support. 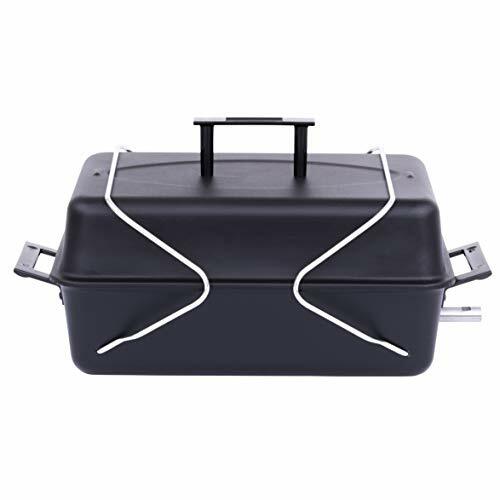 Quality heavy duty material with corner straps to slip around corners but somewhat tight. Have to stretch it tight to get it on. I've been using one of these to cover my grill for 5 years now, and it's still in good shape, even after protecting my grill against Colorado winters for 4 of those 5 years. It's easy to put on and take off, and offers protection against rain and snow. Weber grills may be durable, and the porcelain coating definitely helps, but I still cringe when I see an uprotected grill getting rained on for months on end. 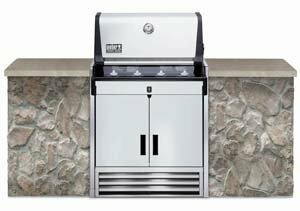 Constructed with the sleekness and durability of stainless steel, Weber's Summit grills are arguably the most refined gas grills ever built. The Summit Gold A stands 61 inches tall, 68 inches wide, and 30 inches deep and features an input of 57,600 Btu's per hour. A brand-new burner system, featuring six burner controls on the front of the grill, allows all 648 square inches of the primary cooking area to heat evenly and thoroughly. The Crossover Ignition System lights all burners in succession with the push of one button. The Gold A's expanded total cooking surface of 902 square inches, including main grates, warm-up basket, and warming rack, makes it easy to use various cooking styles: direct grilling for steaks and hamburgers combined with indirect heat for keeping grilled foods warm, toasting bread, or cooking delicate foods like fish and vegetables. The Summit Gold A also boasts restaurant-grade enhancements, such as a commercial-grade front-mounted thermometer and two stainless-steel cooking grates that are robot-welded for incredible strength. The hood, made of lustrous stainless steel, will never rust, peel, or fade, and its brushed stainless-steel handle stays as cool as it looks. Patented Flavorizer bars, made from heavy-gauge stainless steel, eliminate flare-ups and impart a rich flavor by vaporizing meat juice into steam and smoke. With the 12-footquick-disconnect hose, connecting your natural gas supply is, literally, a snap. There are even spiderproof screens specially created to eliminate the frustrating problem of burner tubes clogged by cobwebs--Weber really did think of everything. 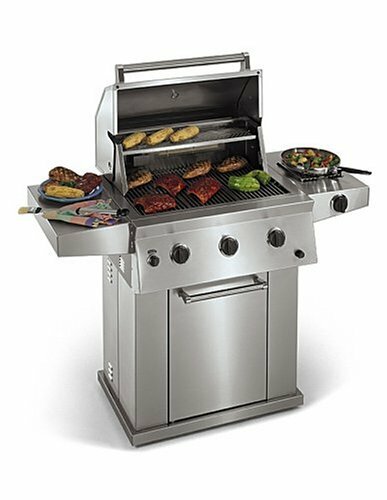 Constructed with the sleekness and durability of stainless steel, Weber's Summit grills are arguably the most refined gas grills ever built. The Summit Gold B stands 61 inches tall, 68 inches wide, and 30 inches deep and features an input of 57,600 Btu's per hour. A brand-new burner system, featuring six burner controls on the front of the grill, allows all 648 square inches of the primary cooking area to heat evenly and thoroughly. The Crossover Ignition System lights all burners in succession with the push of one button. The Gold B's expanded total cooking surface of 902 square inches, including main grates, warm-up basket, and warming rack, makes it easy to use various cooking styles: direct grilling for steaks and hamburgers combined with indirect heat for keeping grilled foods warm, toasting bread, or cooking delicate foods like fish and vegetables. The Gold B also comes with a handy side burner--not found on the Gold A model--for whipping up side dishes and sauces as you grill. The Summit Gold B also boasts restaurant-grade enhancements, such as a commercial-grade front-mounted thermometer and two stainless steel cooking grates that are robot-welded for incredible strength. The hood, made of lustrous stainless steel, will never rust, peel, or fade, and its brushed stainless-steel handle stays as cool as it looks. Patented Flavorizer bars, made from heavy-gauge stainless steel, eliminate flare-ups and impart a rich flavor by vaporizing meat juice into steam and smoke. This liquid propane (LP) model includes a 20-pound LP tank. There are even spiderproof screens specially created to eliminate the frustrating problem of burner tubes clogged by cobwebs--Weber really did think of everything.